Oi, where to start this morning? You know those 2010 Prius brake problems? Toyota learned its lesson and is willing to cop to a design problem. Will there be a recall? Did Woz doom or save Toyota? UPDATE! 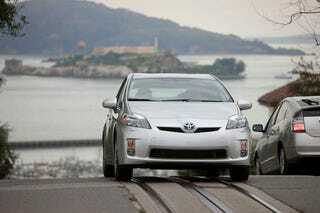 As you'll remember, Steve Wozniak's Prius has been in the spotlight since he complained about cruise control. The issue with the brakes came from the Japanese, though there was a similar issue on this side of the Pacific. Toyota admits there's a problem and, oh Lord, it's a software issue. There's a "disconnect" in the ABS and it'll lag one second before it starts braking. Fortunately, Toyota changed the software in January so new Prius hybrids don't have the problem. But what about the old ones? Normally, the software update would probably be made at the dealer when the car comes in for routine service without a recall. This time? It's possible they may have to recall the cars. And Woz? We've been on top of this story all week and, while Wozniak has a cruise control issue (and it may just be his misunderstanding of how it works, we don't know), he keeps popping up in stories this morning about the Prius blaming the "software" on the other issue as an expert on car software. He is not. The guy is unfortunately charismatic so expect to see more stories with him talking about software. We're so glad Steve Jobs drives a Mercedes.